Sandi Robinson was sure to layer up before hitting the Chicago streets Monday night. Sweatpants? Check. Tights underneath? Check. Long sleeves, gloves, hat, and boots? All check. Robinson is the co-founder of the community organization ChiGivesBack, and her priority right now is the 5,600 people who live on the streets of Chicago. You see, the polar vortex-induced cold is on its way—and even those accustomed to Chicago’s harsh winters are going to have a hard time with this one. The Midwestern city is expected to see wind chill temperatures plunge to -46 degrees Fahrenheit or lower Wednesday evening. The National Weather Service is directing people to avoid the outdoors entirely because this level of cold is “life-threatening.” Any exposed skin is in danger of frostbite, and individuals risk hypothermia. To help the city’s homeless survive, Chicago has added 500 more beds in shelters and opened two more 24-hour warming centers to offer refuge. Shelters typically open at night are open during the day, too. The city has even set up public buses near encampments for the homeless to stay inside. Still, many homeless people will choose to remain outdoors to protect their belongings, to stay with a partner or pet they’d be separated from in a shelter, or to avoid shelters where they experienced a traumatic event. The list of reasons goes on and on, but the reality is many will stay outside. Someone with the Salvation Army going tent by tent to inform people of their options. Still, Dworkin hopes people take advantage of the additional resources that are becoming available this week. So does the Salvation Army. While the charity organization always tries to bring homeless people indoors when temperatures drop below zero, it’s been dedicating more resources to this effort since Friday with the polar vortex-induced cold snap nearing. “Part of my concern in these tent areas is they’re warming themselves in unsafe ways,” said Nancy Powers, a program director with the Salvation Army’s Freedom Center, to Earther. She described seeing propane heaters in tents that aren’t ventilated properly, and tents full of candles. Powers has been going around these homeless encampments, offering cups of tea and boxed lunches. Her goal is that all these years of trust building will pay off and that individuals who typically refuse to head to a shelter will go to the Salvation Army’s. Meanwhile, Robinson and her volunteers are thinking about those who won’t go to a shelter at all. Since Monday night, she’s been going around with about eight others handing out blankets, clothes, gloves, propane tanks for heating, bus cards, gift cards for food, and more. Robinson knows she’ll be needing a face mask to continue the work later this week once the worst of the cold sets in. But she also knows that the work must go on. The threat is real. 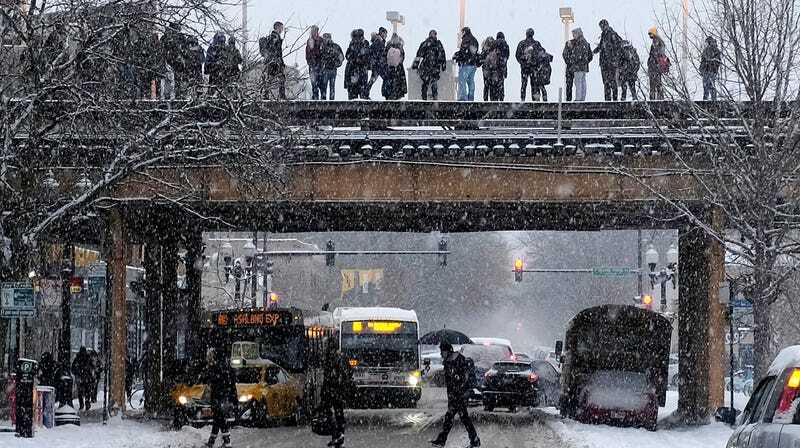 A man in Chicago died last week from hypothermia, as did a homeless man in Missouri, which is also starting to feel the effects of the polar vortex. Roughly 700 homeless people die a year due to hypothermia, according to the National Health Care for the Homeless Council. Some homeless people in Chicago attempting to stay warm. are at the greatest risk,” said Jeff Schaider, the chairman of the department of emergency medicine at Cook County Health and Hospitals, to Earther. It isn’t just the homeless we need to be concerned about. Lower-income families are vulnerable if landlords won’t turn up the heat or if they can’t afford to pay their energy bill. While it isn’t quite true that Chicago will be “colder than Mars” this week, with an expected high temperature of -13 tomorrow the city will be colder than parts of Mount Everest, Antarctica, and even Siberia. And that truth is nothing to take lightly.